Compact size, utilizing a rugged case with weatherproofing O-rings, rated to JIS7 submersion specifications (immersion to 3 feet for up to 30 minutes). Large concentric control knobs for easy adjustments while wearing gloves. 900 Memory Channels with alpha-numeric labels, assignable into 24 memory Banks. Internal temperature sensor built in, with barometric pressure display via optional SU-1 module. External DC operation capability while charging battery pack. 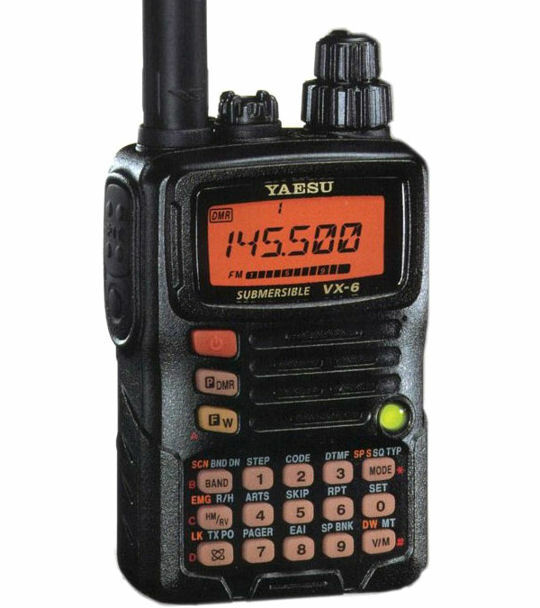 The Yaesu VX-6R is a triple band (VHF / UHF) HT with extensive receive coverage, and leading-edge features. It is an easy-to-use "little brother" to the VX-7R, and is both submersible (JIS7: 30 minutes of submersion at depth of 3 feet) and extremely rugged. The VX-6R provides wide receiver coverage at 504 kHz ~ 998.99 MHz (cellular blocked), and puts out 5 Watts of power on the VHF and UHF bands (1.5 W on 222 MHz). The standard memory has 900 channels with 6-digit alpha numeric tag, and 24 memory banks for channel allocation. 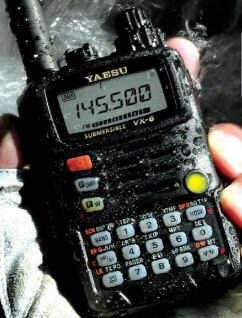 Supplied with an incredibly compact FNB-80LI 1400 mAh Lithium-Ion battery pack, the VX-6R includes a number of new and innovative features, including the new "Emergency Automatic ID" (EAI) system, which automatically causes the VX-6R to transmit your call sign and engage your rig's microphone, even if you are disabled and unable to press the PTT switch; Enhanced Paging and Code Squelch (EPCS), that allows you to page a particular station and only receive calls from that station, if desired. A new "Wake-Up" battery saver system extends battery life even more than the previous battery saver circuits. A new security password feature allows you to turn on and operate your transceiver only after you enter your password. There is a direct memory recall (DMR) feature (one-touch memory access system, like on a car stereo), and they have even included a CW trainer for those working on increasing their code speed! And of course CTCSS (PL) and DCS (digital) tones are built in. Other features include: black magnesium case, 24 hour clock, 900 memories, severe weather alert, and multicolor transmit/receive LED. Hikers and mountain climbers may connect the optional SU-1 Barometric Sensor for direct air pressure readings. The VX6R comes with: YHA67 SMA flexible Antenna, FNB-80LI Lithium Ion Battery, NC-72B Battery Charger, CLIP-14 Belt Clip and Wrist Strap. Other: 1000+ memories with alpha-tags. CTCSS (PL)/DCS, DTMF, ARTS.